The goal of many web portals is to select, organize and distribute content in order to satisfy its users/customers. This process is usually based on meta-data that represent and describe content. 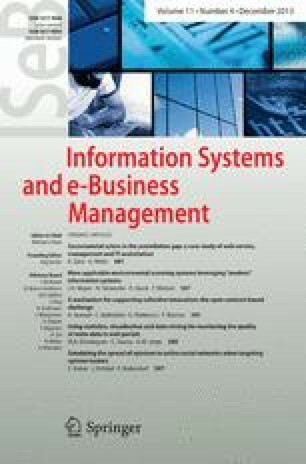 In this paper we describe a methodology and a system to monitor the quality of the meta-data used to describe content in web portals. The methodology is based on the analysis of the meta-data using statistics, visualization and data mining tools. The methodology enables the site’s editor to detect and correct problems in the description of contents, thus improving the quality of the web portal and the satisfaction of its users. We also define a general architecture for a system to support the proposed methodology. We have implemented this system and tested it on a Portuguese portal for management executives. The results validate the methodology proposed. This paper extends and details the work presented in Soares et al. (2005) and Domingues et al. (2006). This work was partially funded by PortalExecutivo. The authors are grateful to PortalExecutivo for their support, and, in particular, to Rui Brandão and Carlos Sampaio for their collaboration.